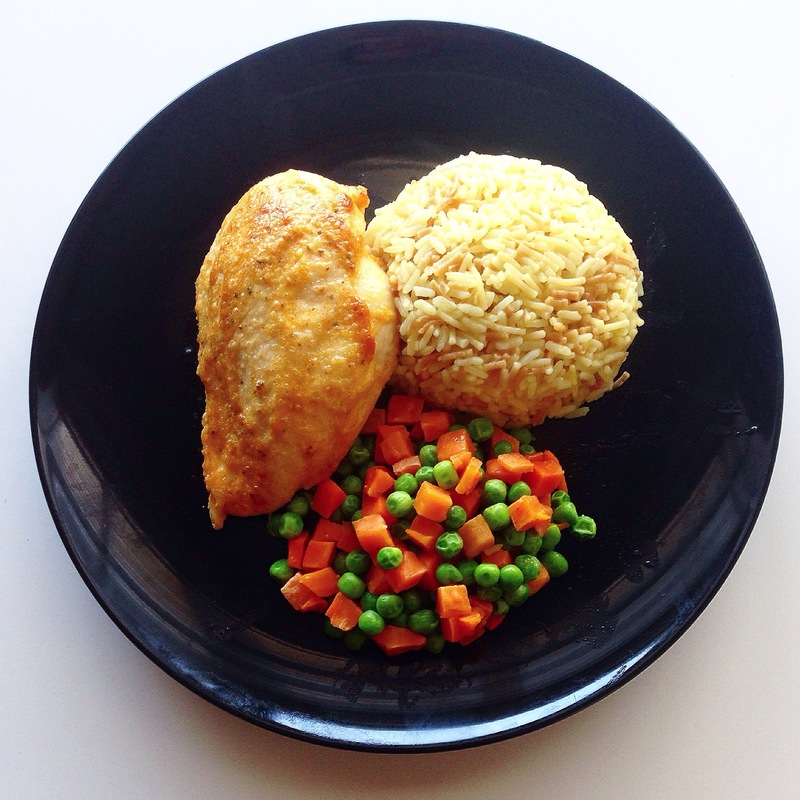 Easy Weeknight Wind-Down: Roasted Chicken with Rice Pilaf and Veggies – Pao Says, "Open Wide!" We just got back from vacation, so I wanted a dinner that was filling but quick and easy to make. What’s easier than tossing something in the oven? Ok, on to the chicken recipe! Preheat your oven to 450 degrees For 4 Chicken Breasts, set your seasoning up in a bowl: mix 2 tbsp mayonnaise, 1 tbsp Parmesan cheese, 2 tbsp olive oil, 1/2 tsp garlic powder, 1/4 tsp each of celery seed, smoked paprika, and cayenne pepper (can add less cayenne if you don’t like too much heat- this amt gave me a mild-medium level of heat). Mix all of your ingredients together and then pour the mixture over your chicken breasts, making sure to coat all sides of each one. The pieces of chicken should be golden when they’re ready to come out! The rice pilaf I used was a Knorr Rice Sides- delicious and very quick-cooking… Only took like 10 minutes from beginning to end! The veggies were frozen carrots and peas. I usually steam them in salted water, drain them, and then add butter and a touch of garlic powder.